Ripens months earlier than most peaches! Imagine an early-ripening peach without any fuzz that's so sweet and delicious, it practically melts in your mouth. That's a lot to ask of a fruit, but Yumm Yumm delivers! It combines the bright, refreshing taste of a great, white-flesh nectarine and the rich sweetness of a white peach, giving it a flavor that's unbeatable for fresh eating, canning and baking. A dependable yielder that ripens in mid- to late June, it's resistant to bacterial spot disease. Self-pollinating. Zones 5-8. Now available as a Reachables®! 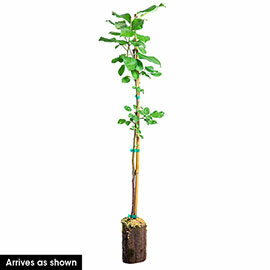 Yumm Yumm™ Reachables® Nectarine Tree produces full-sized fruit on a compact tree. This means it's easier to grow your own fruit even if you have limited space. You can plant Reachables in your garden, orchard or even a container. They are easier to manage than full-sized trees. Now one person can prune, spray, net and harvest the tree—without using a ladder! Please note: Because Reachables produce full-sized fruit on smaller trees, they require a tree support. Height Standard: 15-20 feet. Reachables: 6-8 feet. Reachables tree heights will vary some based on location, soil, light, temperature, and other environmental factors. Foliage: Medium green, long narrow leaves. Flower Form: Light pink blossoms. Pruning: Nectarine trees need to be pruned to optimize fruit production and allow sunlight into the tree. Most home gardeners do not prune their trees enough. Pruning encourages new growth and shapes the tree. Prune nectarines hard, removing most of the previous year's growth. Fruit will be produced on the previous year's wood, so leave enough to ensure a good crop, but not overburden the tree. Removing interior branches opens up the tree and allows light to penetrate to lower branches. 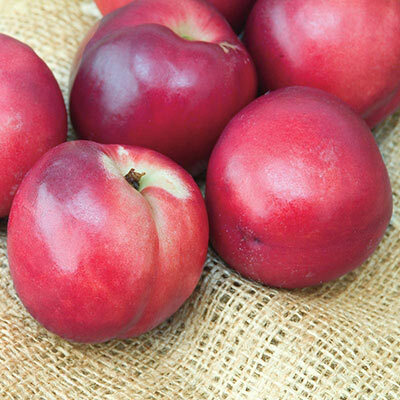 Fruit: Medium - small fruit, mostly red skin with a small amount of white background color. Clingstone with white melting flesh.